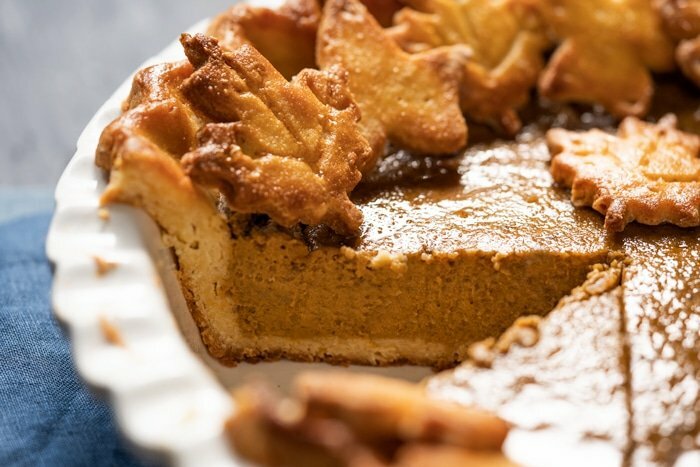 This gluten free and keto pumpkin pie is everything you expect from this wonderful Thanksgiving classic: a deliciously spiced pumpkin custard, all wrapped up in our super flaky pie crust! I dunno about you, but pumpkin pie is too much of a (killer!) classic to mess around with! 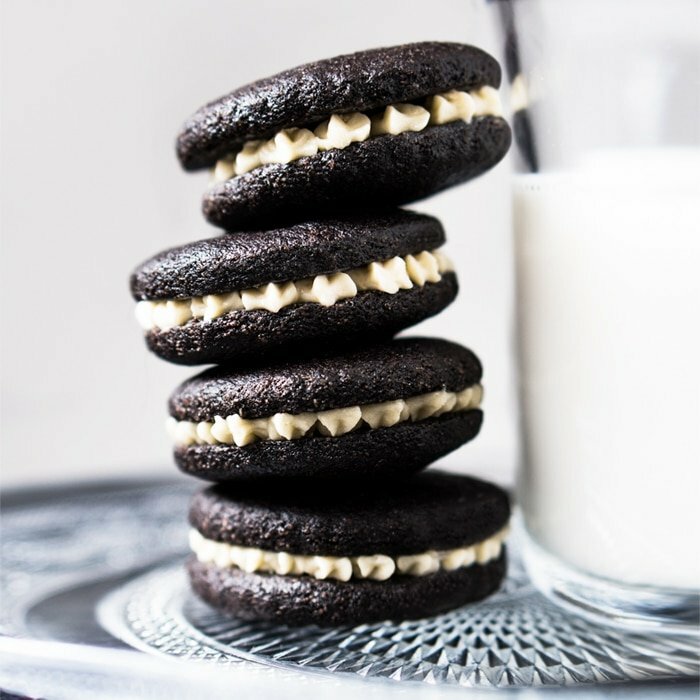 And so you’ll find that this keto version varies little from the original in taste, texture (and all!). Supreme and stunning results, surely worthy of your Thanksgiving table! 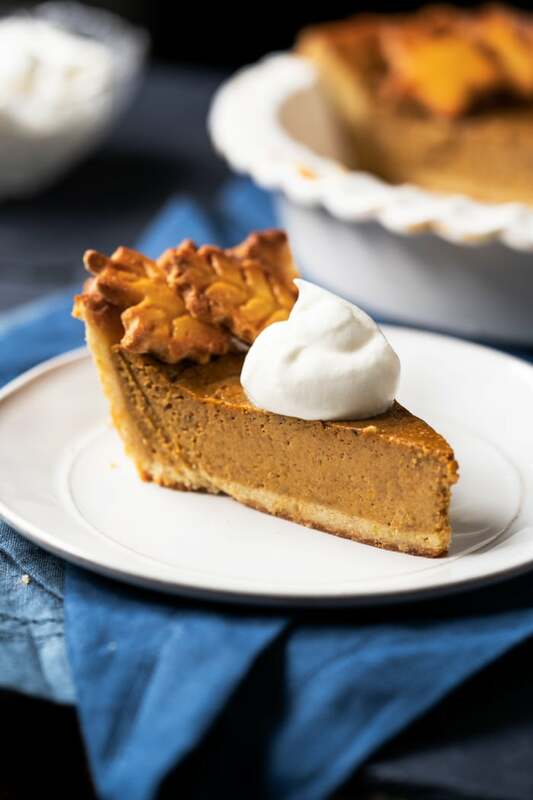 Plus, you’ll be happy to hear that making this keto pumpkin pie is not particularly difficult at all! Though like any custard-type dessert, just be mindful of a few details below to ensure the perfect slice. Read on! 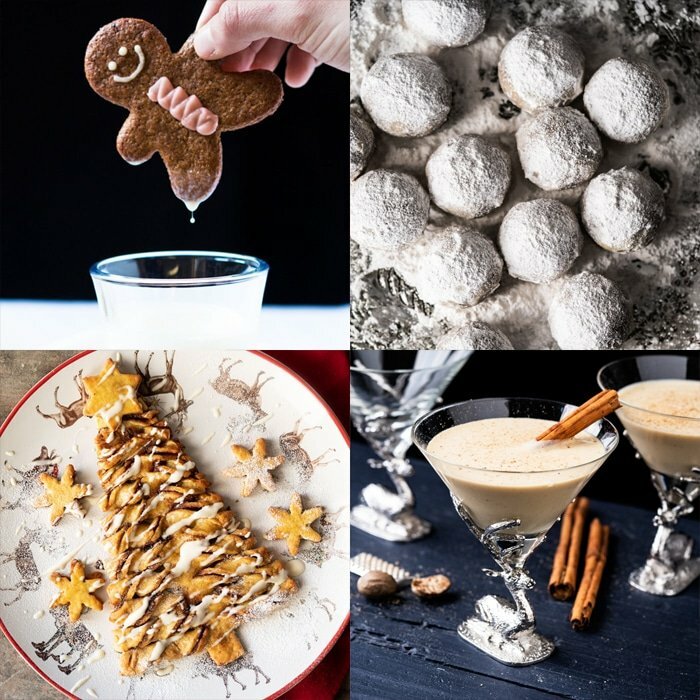 How Make A Pretty (& Delicious!) Pie! Let’s face it, when it comes to Thanksgiving, you most definitely want to put your best pie forward! So let’s talk about a few details (and cheats!) 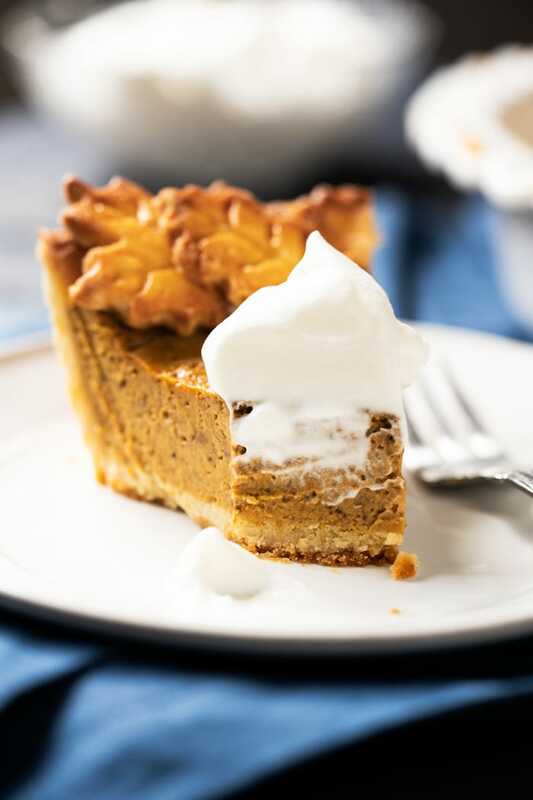 of what you need to look out for when making this keto pumpkin pie so you get a real stunner. 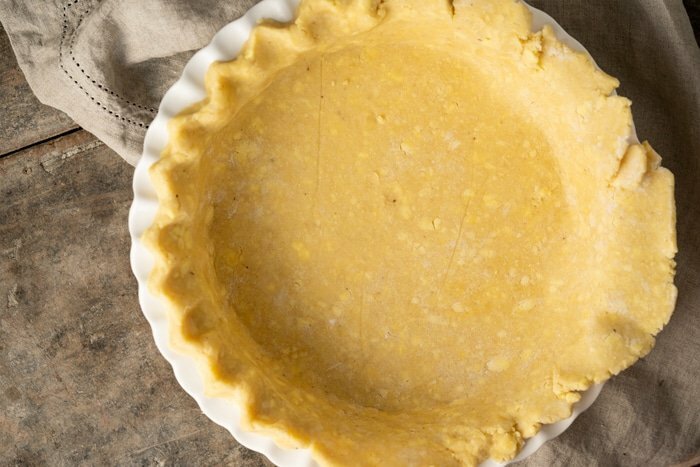 Make sure your pie crust is very cold, and work quickly in a relatively cool environment (i.e. 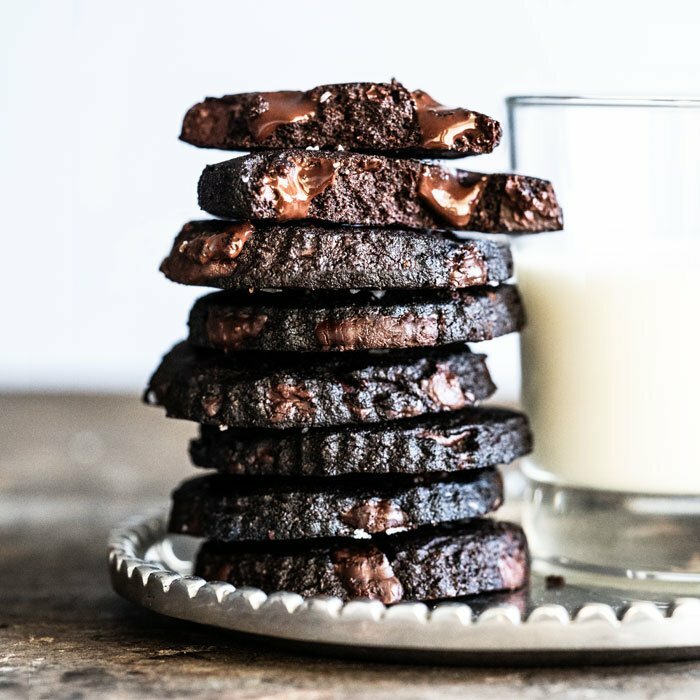 not next to your preheating oven!). 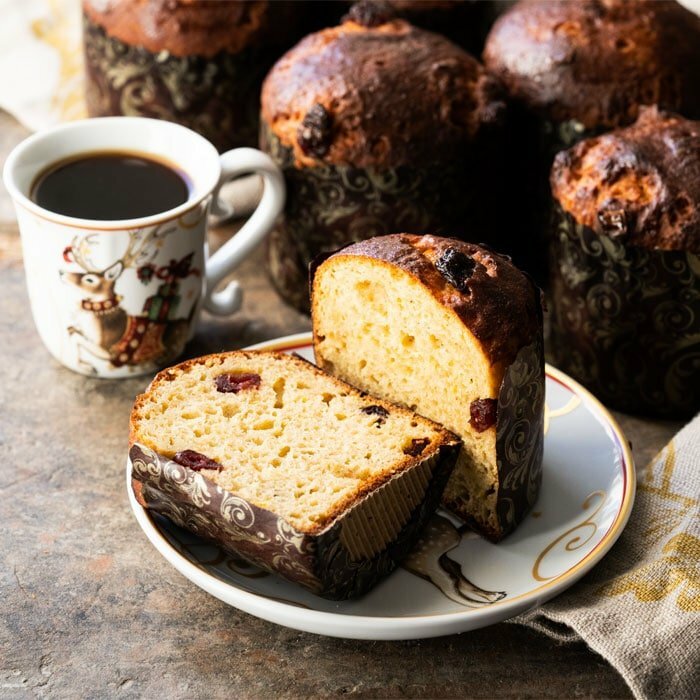 This will keep it more manageable, and if you feel like it begins to melt away simply pop it in the freezer for 15 minutes before carrying on. Did it break a bit? No worries, just patch it right up! Oh, and you can also crimp the edges (as you can see! ), but it feels a bit more like play-dough than pie crust (you’ll know what I mean). To blind bake or not is perhaps the eternal pie conundrum. I’ve done it both ways here, and while you do get a slightly flakier pie crust with a blind bake, it’s also honestly debatable if it’s worth the extra hassle here. So I suggest you just bake it all at once and save yourself a couple hours (cooling down time etc). The right spices are clearly important. And while you can buy ready-made pumpkin pie spice, I will always advocate for freshly ground nutmeg (it’s game changing guys!). And I also borrow a tip from the peeps over at King Arthur, and add a dash of freshly ground black pepper. 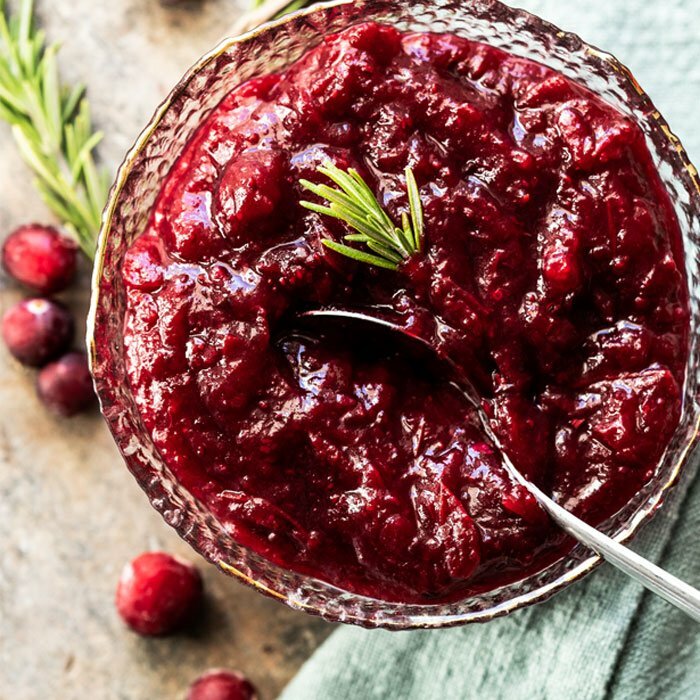 You won’t taste it, but it will add a great deal of depth to your pie. Don’t overcook! 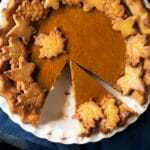 Cracked pumpkin pies made with sugar are the result of over-baking (as the egg proteins continue to cook as they cool). Now, when I baked this pie with erythritol, it cracked close to the edge from minute 25 of baking. Could be my 20-year old oven (reliable, but can run a bit hot)… but this didn’t happen with xylitol. Didn’t affect the final texture, just a heads up. Otherwise, just like with sugar pies, you want to take it out of the oven while still jiggly in the center. But note that, unlike their sugar counterparts, the pie doesn’t feel fully set around the edges even after minute 60 (but a toothpick inserted will come out mostly clean, not drenched). Get your leaves on! I whip up a double batch of the pie crust, and make some crackers and pretty cutouts with it (leaves are my favorite). Good for your cheese platter and some pie decorating; particularly handy if you do end up with some cracks. 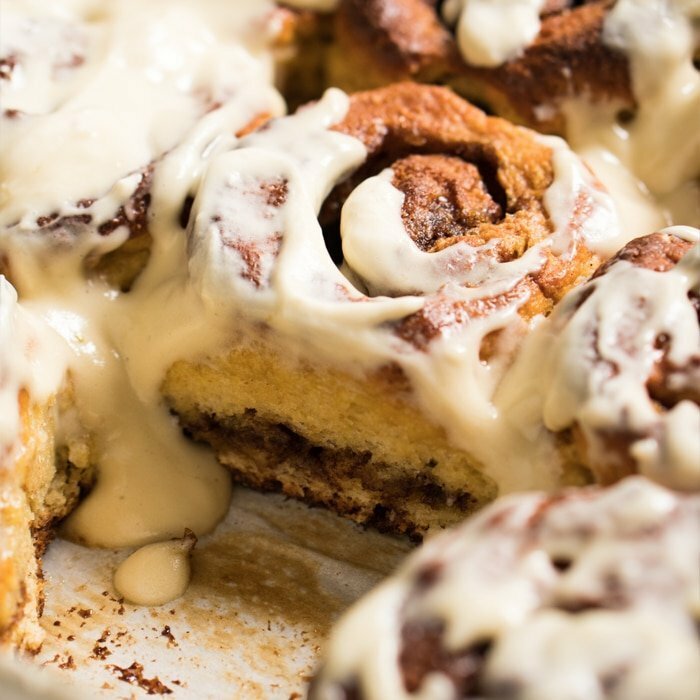 Or some good-old whipped cream will do the trick just as well. Did your pie become opaque? Yup, erythritol tends to do that in custards! I simply gave mine a very light (and gentle!) brush with some Lakanto syrup and everyone was non the wiser. Oh, and it doesn’t affect the taste or texture at all; so not a biggie! As you can read from the previous section, this is probably the thing you need to consider the most when whipping up this pumpkin pie. But you’ve also got plenty of options: think xylitol, allulose and erythritol. 1. Xylitol and allulose behave fairly similar in custards, and are probably the ‘best’ choice in terms of both taste and looks. Absolutely no aftertaste and there are no problems with crystallization. Allulose is 70% as sweet as sugar (i.e. you need to add 30% more). 2. I also tested the pie with erythritol (Lakanto golden! 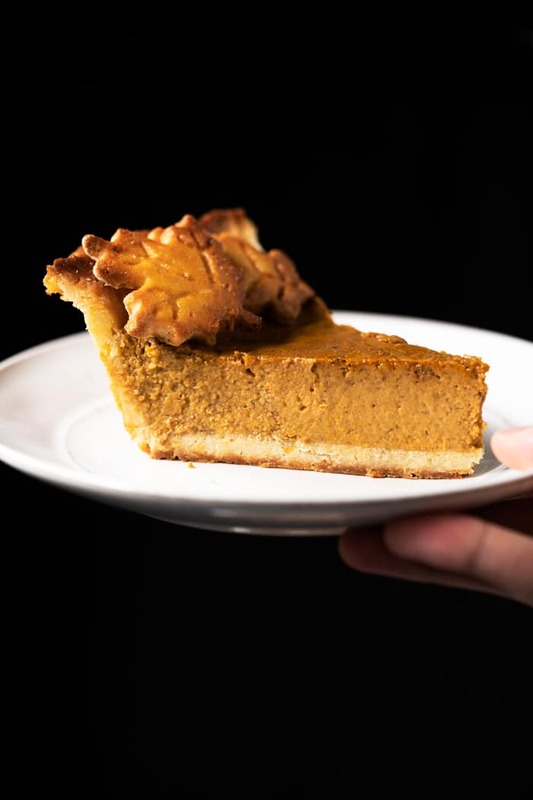 ), and while there was no aftertaste there were a few issues with crystallization here and there (as in the pie slowly became opaque, rather than nice and shiny). The pie also did seem to crack a little bit as it baked, but cooled down just fine and I didn’t find there to be any cooling aftertaste at all. How much sweetener? Traditional pumpkin pies generally call for a cup of sugar (half brown, half granulated). I find this is a bit too much for keto adjusted palates, and added 2/3 cup to mine. Still felt quite sweet and dessert-like, so you could probably even go down to 1/2 cup if you wish to just lightly sweeten it. 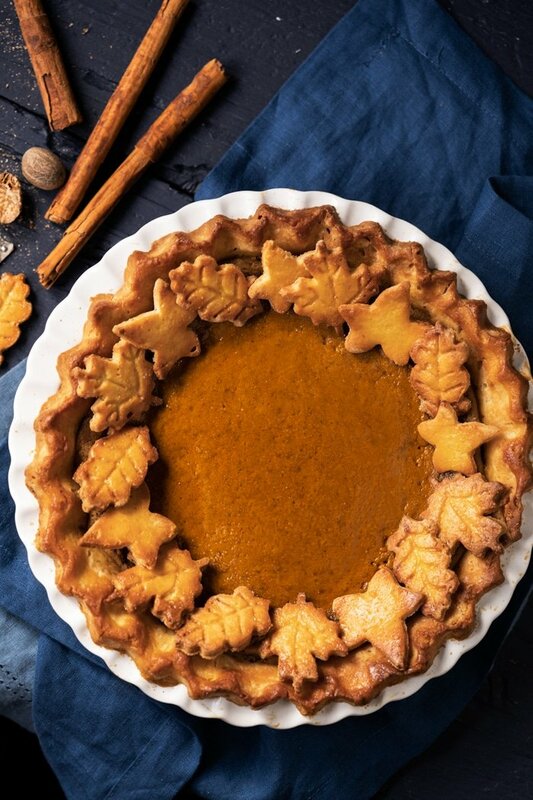 This gluten free and keto pumpkin pie is everything you expect from this Thanksgiving classic: a deliciously spiced pumpkin custard, all wrapped up in our super flaky pie crust! See recipe video for guidance on the pie crust! Lightly butter a 9 inch pie pan. 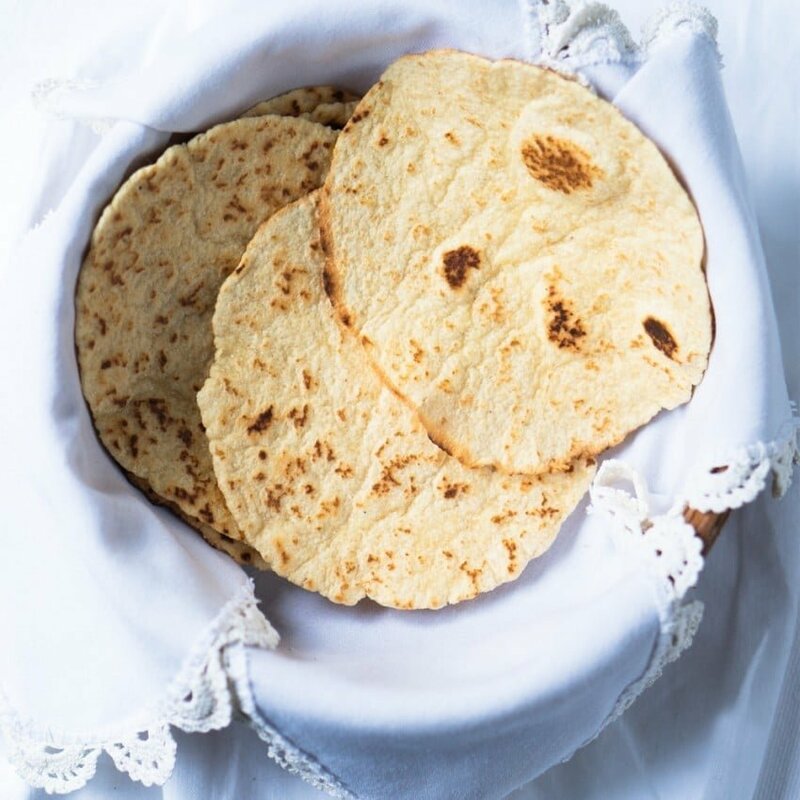 Roll out pie crust into a roughly 13-inch circle, between two sheets of parchment paper. 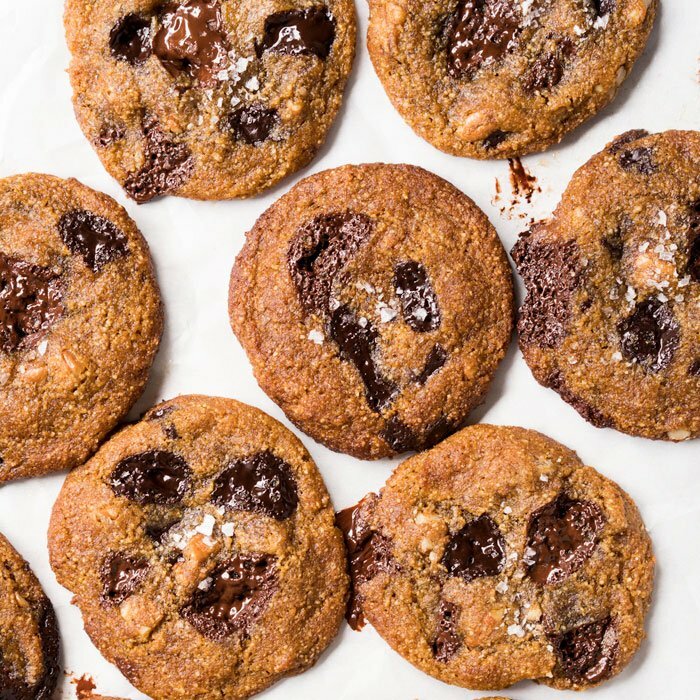 Feel free to lightly dust with coconut flour as needed. Transfer to the pan, using the parchment paper as an aid. Crimp the edges (or simply trim). 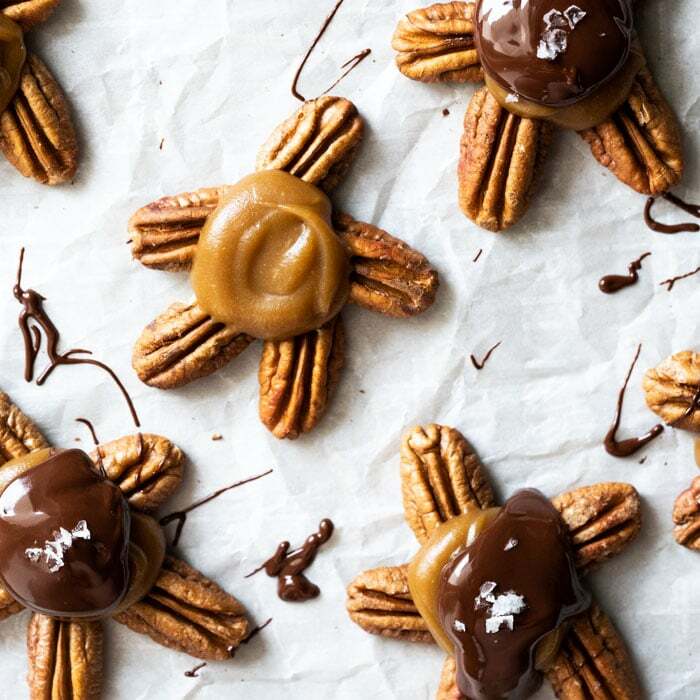 Refrigerate and preheat oven to 400°F/200°C while you make the filling. Mix together in a small bowl the sweetener, salt and spices. Set aside. Lightly beat the eggs in a large bowl. Add in the pumpkin puree, heavy cream, vanilla extract and continue to beat until thoroughly incorporated. Beat in the sweetener and spices mix. Place the refrigerated pie pan on a baking tray and cover the edges with aluminum foil (to prevent over browning). Pour in the pumpkin filling and bake for 50-65 minutes, uncovering the edges around minute 40. A few things to note: the filling didn't begin to rise for me until about minute 35, and with sugar alcohols the pie will appear to still not be set even after 60 minutes. Having said that, a toothpick inserted 2-inches from the edges should come out barely moist, and the center should still be jiggly. Allow the pie to cool completely at room temperature, as it will continue to cook and set while cooling. I also always like my pumpkin pie best after a couple hours in the fridge. *Please see section on sweeteners for deets. Please note that nutrition facts were estimated per slice, pie crust and custard included (4.5g net carbs)! have you done this by hand or in a KitchenAid? I don’t have a good processor. OMG Paola! I made this and it is out of this world!!! The best pie I ever ate- no joke! Thank you!!!! P.S. My guests were speechless after I told them it’s keto!! 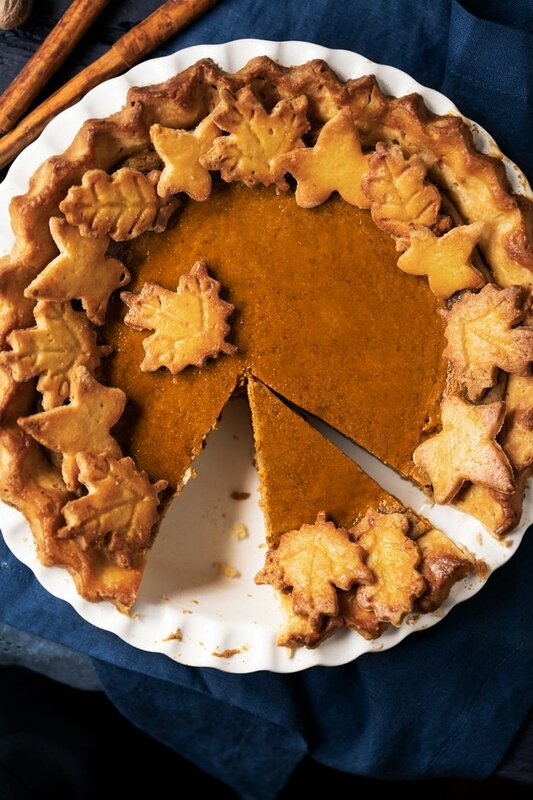 I want to add the cutouts to my pie. Do you have directions for when they should be added? Bake cutouts first and add to pie at the end, add cutouts to pie in the beginning or add to pie mid-bake? Thanks!